We are in a deep freeze. In the past couple of days, our temperature here in Iowa had struggled to get up to double digits (Fahrenheit). We have not been above freezing point for more than a week or so now, and I don’t see it happening for the next couple of days. Or weeks? Or months?! We have accumulated a few of inches of snow on the ground as well, from snowfall from few days ago. I believe the ground snow will linger for a while (White Christmas then? ), and will not melt, as our temperature will remain subfreezing for the next several days. My son’s snow fort, which he built a couple of days ago, is still standing sturdy and proudly in our front yard. I like the sight of snow. But I don’t like driving on it, nor shoveling it. I don’t like the bitter cold either. I grew up in a tropical country (Philippines), where the coolest temperature is in the low 70’s F. And believe it or not, when the temperature in the Philippines drops in the 70’s F, it is already considered sweater time! Speaking of sweaters, since I live now in a place akin to being inside an icebox, I have learned (or forced) to dress warmly. Over the years I have collected a few sweaters. And for the past two weeks now, I have been wearing my different collection of sweaters and cardigans to work, on top of my usual khakis and shirts. Coat and tie is not my style, at least not in the hospital. I am not sure if I would be glad with that compliment or not. Or is it even a compliment? Well, at least she said “classy” sweaters. Here in this part of our world, “ugly” sweater is more notorious. 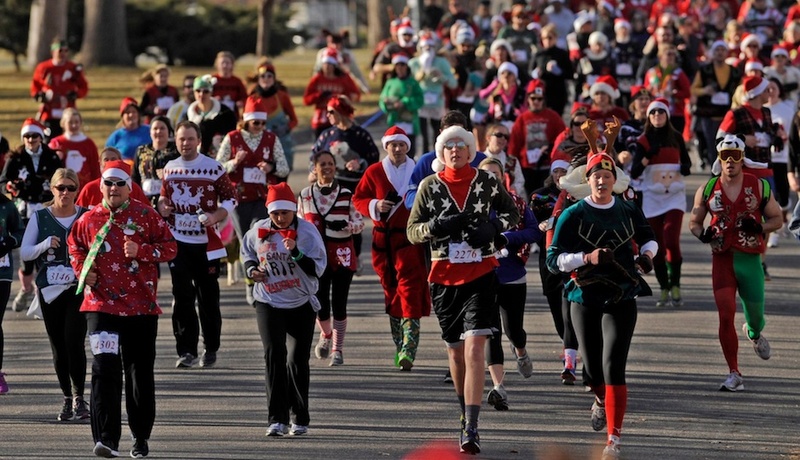 They have ugly sweater parties, ugly sweater contests, and I know there is even an ugly sweater event run. Though I cannot really take credit for my “classy” style. My wife bought all those sweaters. She must have a fine taste and she is dressing me right. She is a good shopper as well, as she got those quality items at discounted price. But to be compared to Imelda Marcos? That is different. Well, she got good taste, I’ll give her that. But being “Imeldific” has a different connotation. Besides I don’t have thousands of sweaters as Imelda has thousands of shoes! I only have a few sweaters. OK, more than a few. This made me think: am I living lavishly and excessively? I hope not. There’s so much need in this world that is more important than fashion. Maybe I am over thinking the nurse’s comment, which she intends as a compliment, and nothing more. Maybe she just really admire my sweaters. Or maybe she was just impressed with my GQ fashion sense (barf!). At least I have an excuse for having all those sweaters. It is so darn cold! I have a good sense for fashion. Or so I thought. At some point in my younger years I have owned a couple of deep purple shirts, a hot pink shirt, an electric-blue-colored sweater, a maroon leather shoes, and an aqua-green canvas shoes among others. Most of my youth though, I have worn school uniform, which sometimes I hated. This have limited my expression for fashion. (Maybe that was a good thing or I could have worn more atrocious get-up.) I wore boring black pants and white polo shirt every day. So in my graduation in college, I expressed myself fashionably: I wore black long-sleeve shirt with red stripes, white pants, white bowtie, with my shirt tucked out, cream-colored leather shoes, and no socks. Hey, it was the 80’s, days of the “Bagets”. As I grew older, my taste became more subdued, with more of earth-tone color. During my residency training in New Jersey, it was encouraged that we wear a shirt and necktie, to look professional. At least we looked professional, even though we didn’t act like one. Due to much leg work during the training, some of my male co-residents wore tennis shoes with their dress shirt and tie. I know that was a fashion faux-pas, so I did not do it. But I wore sneakers with scrub suit whenever I’m on-call. Then we moved to New York, New York, mecca of the fashion world, for my fellowship training. You would guess that I became more fashionable with all the fashionistas in the city. Wrong. I wore hospital scrubs and clogs for the whole year. The only time I wore shirt and tie was during the day of picture taking. When I began my practice, I wore neckties plus my white lab gown to look more respectable. This made me look like I know what I’m doing even if I don’t. However as I grew older, I got tired of wearing ties. Who dictated that coat and tie is the professional look anyway? And who said tying a fabric noose around your throat is fashionable? And dress coat? No way I’m wearing that to work. There were studies that the neckties of doctors can be vectors of organisms and transfer the germs from one patient to another as they dangle down and get in contact with patients. Who knows what dangerous organisms are lurking in a doctor’s tie? So nowadays, I left my neckties hanging in my closet instead of my neck. Wearing a bowtie (which may be less contaminated as they don’t dangle around) is never an option. Since I got married, I also have my own fashion police in my house. Now, I cannot leave without being scrutinized. There were even times that my wife asked me, lovingly though, to change my outfit, as they did not match. I know my wife was just making sure I don’t dress like a clown. However that does not prevent me still, from making a fool out of myself, whether I’m fashionably dressed or not. Deciding what to wear and matching your clothes ensemble can be a hazzle and time-consuming. So recently, I simplified my fashion apparel. I bought all khaki pants, and shirts that are either white or blue. Now I don’t have to think what I should wear. The fashion police will not be on my back anymore. Come to think of it, I’m back on wearing uniforms, even if it is not required. Funny, what I hate when I was young, is what I love now. I know I will never grace the cover of GQ Magazine. I also know that there are more in life than worrying what to wear, or be concerned if my socks matches my pants. Sadly to say, the world is more likely to judge us by the color of our shirt and tie, rather than the purity of our character. I still have a deep purple T-shirt today. But I only wear it with my pajamas, in bed.